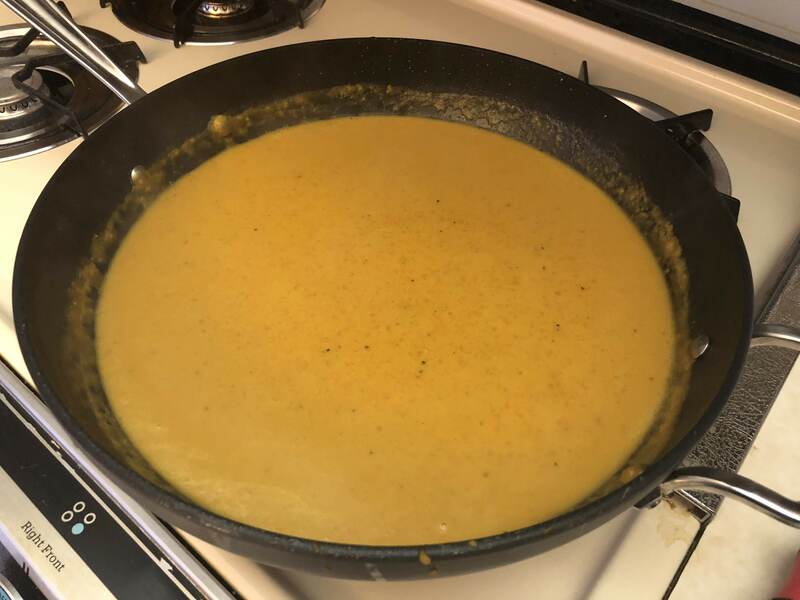 I recently had a bowl of Butternut Squash Bisque at a restaurant while traveling and it was one recipe I knew I had to remake! 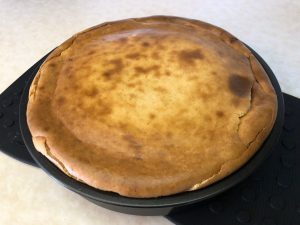 It took a few tries, but I have something luscious and delicious to share with you. 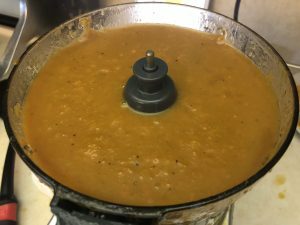 Soup is such a popular fall dish; it warms the body and curbs those comfort food cravings as the temperatures start to drop. This Butternut Squash Bisque is thick, creamy, rich, and healthy – great for a cozy dinner! I’m calling this recipe “bisque” instead of “soup” because it’s so thick and creamy. 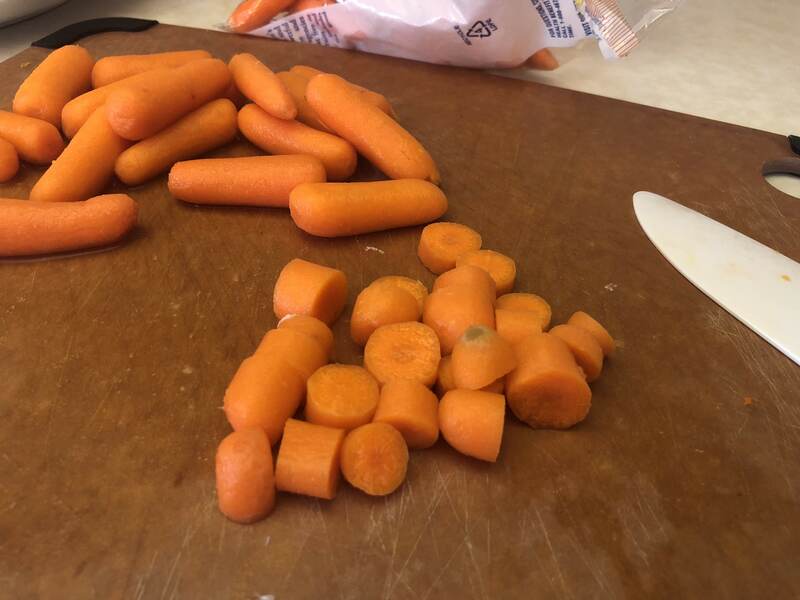 I start by chopping all the veggies and doing some prep work. 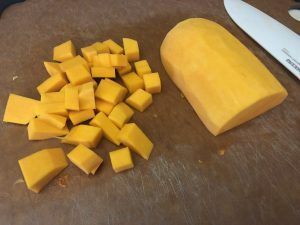 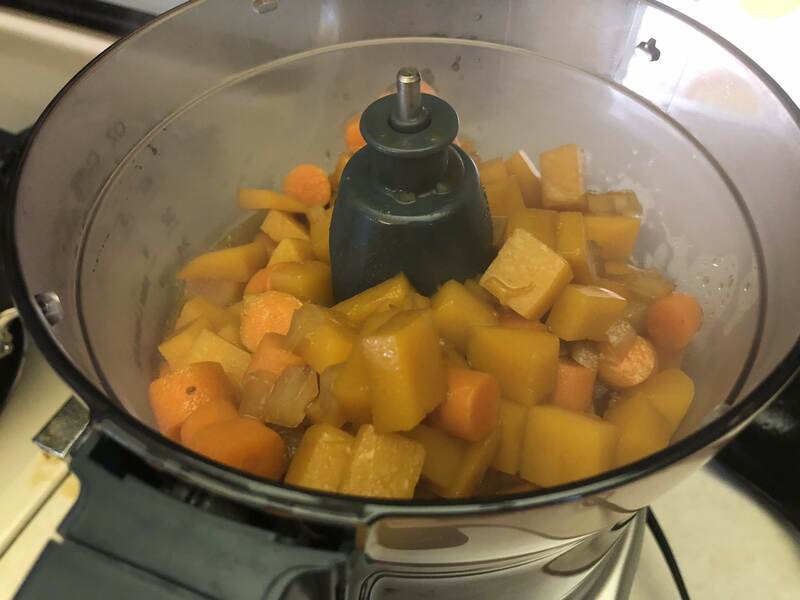 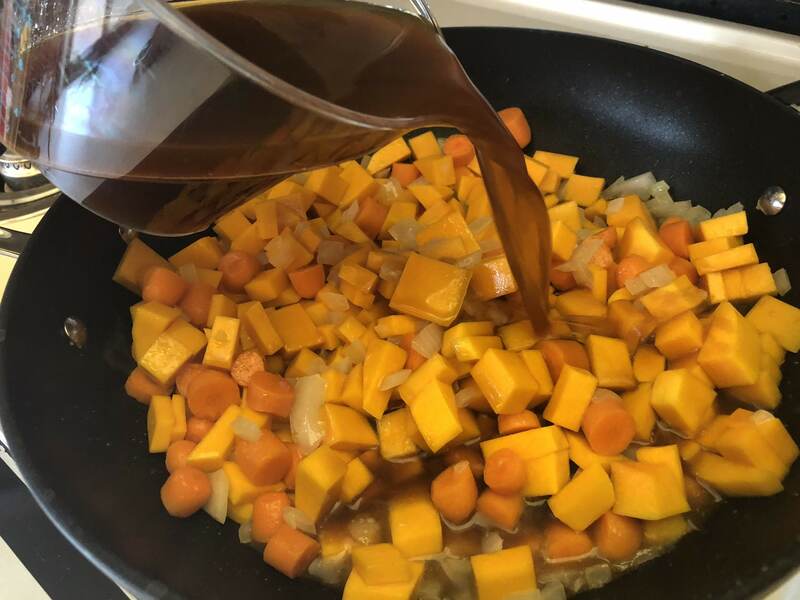 This was the longest part of making the bisque and admittedly was my first-time preparing butternut squash, so it took some getting used to. 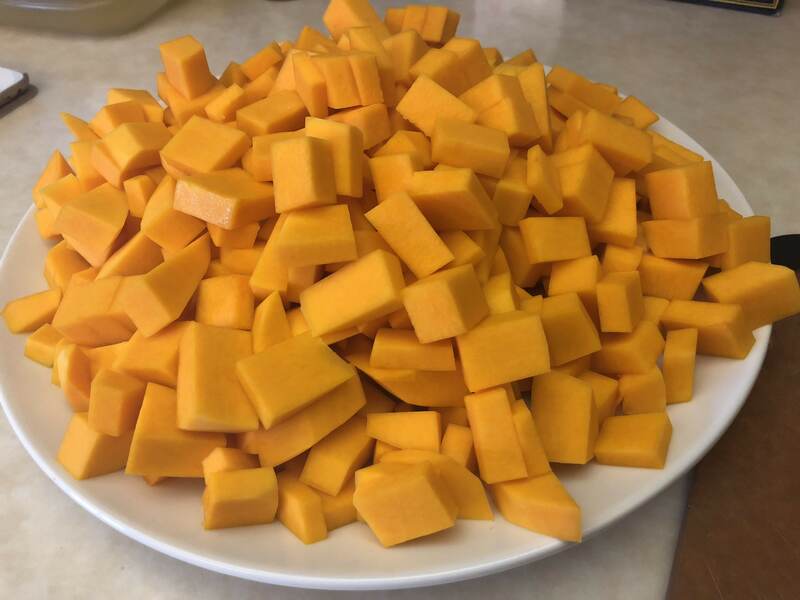 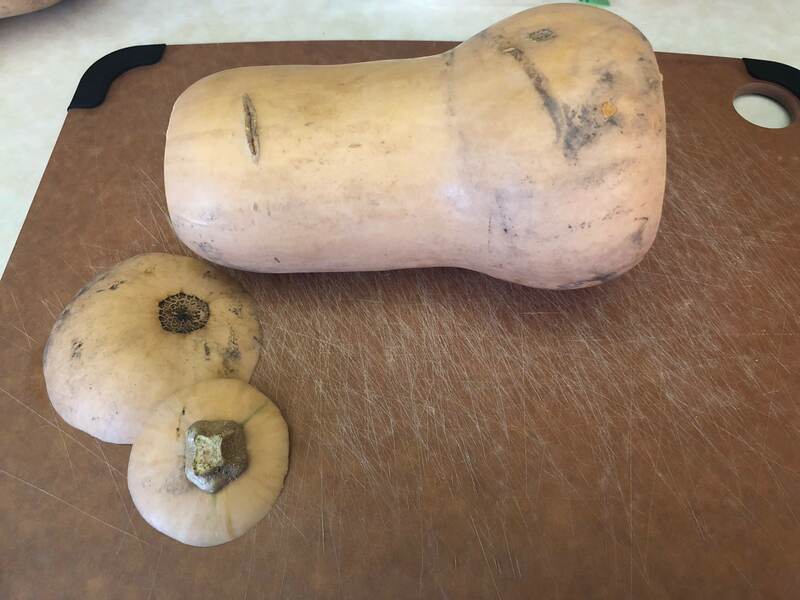 If you’ve never cut squash before, start by cutting off both ends, then cut in half, so you have one piece that is longer and thin and one piece that is shorter and round (the round part has the seeds). 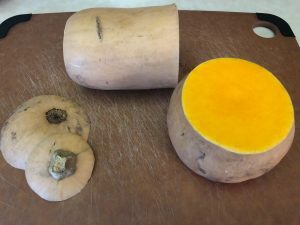 I then used a potato peeler to remove the skin and the “white part”. 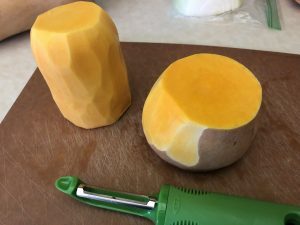 You want to peel down to the rich golden color. Then you can slice each piece in half, remove the seeds, and chop. Chop the onions and carrots as well. 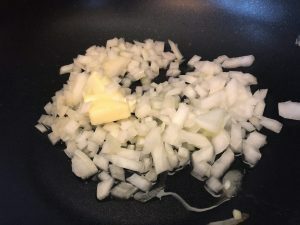 Heat the oil and butter in a skillet or pot over medium heat. 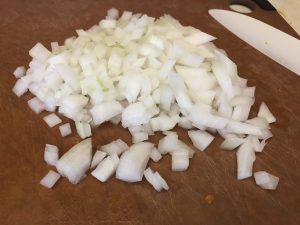 Add the onion and cook until tender. 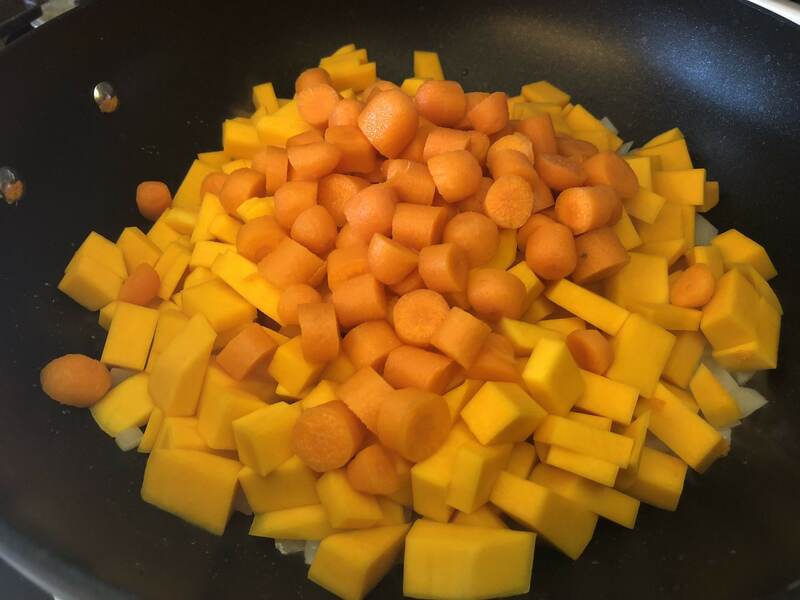 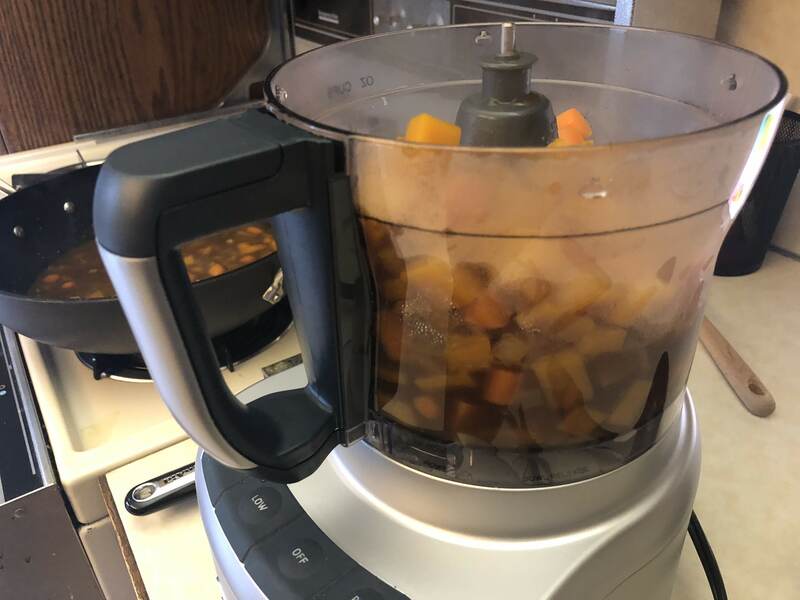 Add the carrots and squash and stir to combine. The pan with be a lovely combination of orange and yellow colors. 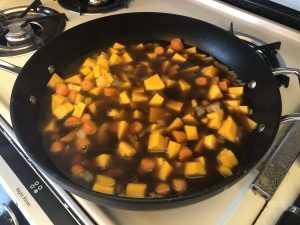 Add the vegetable stock and seasonings. 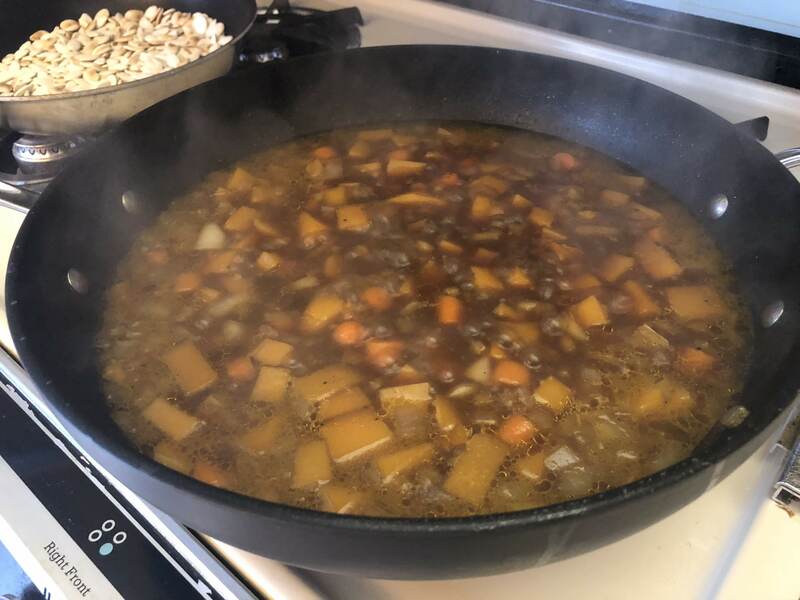 Bring to a boil, then reduce the heat and simmer until the veggies are tender. This took about 10 minutes and my kitchen smelled amazing! Add the mixture back to the skillet or pot and heat on low. 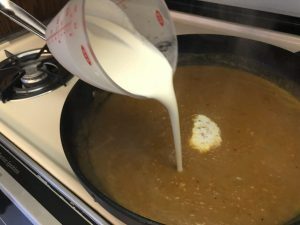 Add the heavy cream and stir to combine. The bisque is ready to serve! 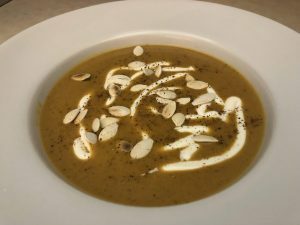 I served mine with sour cream and toasted pumpkin seeds. 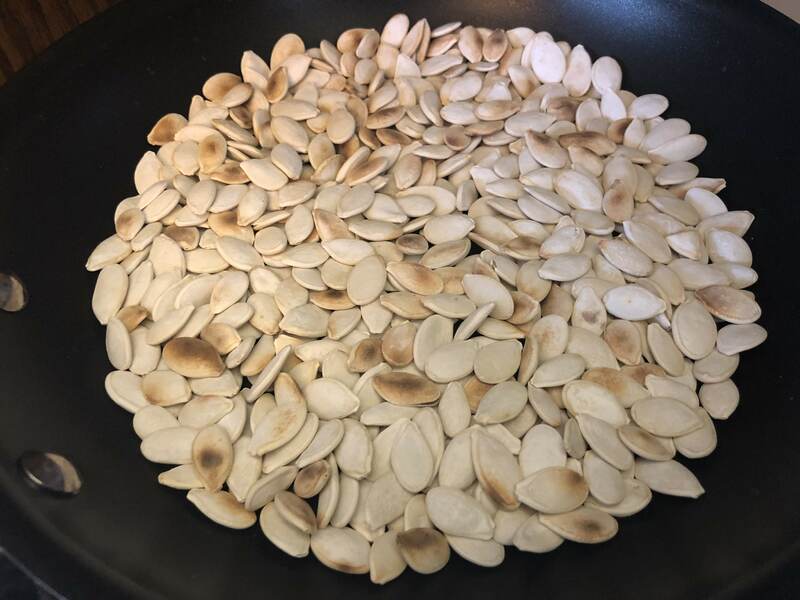 I bought a separate bag of pumpkin seeds and toasted them in a skillet over medium heat for about 5 minutes. 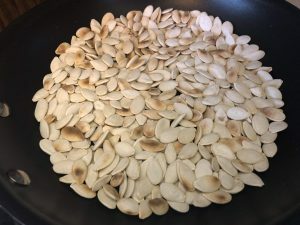 You can also use the seed from the squash if you clean and dry them before toasting. The Butternut Squash Bisque recipe can be found here. 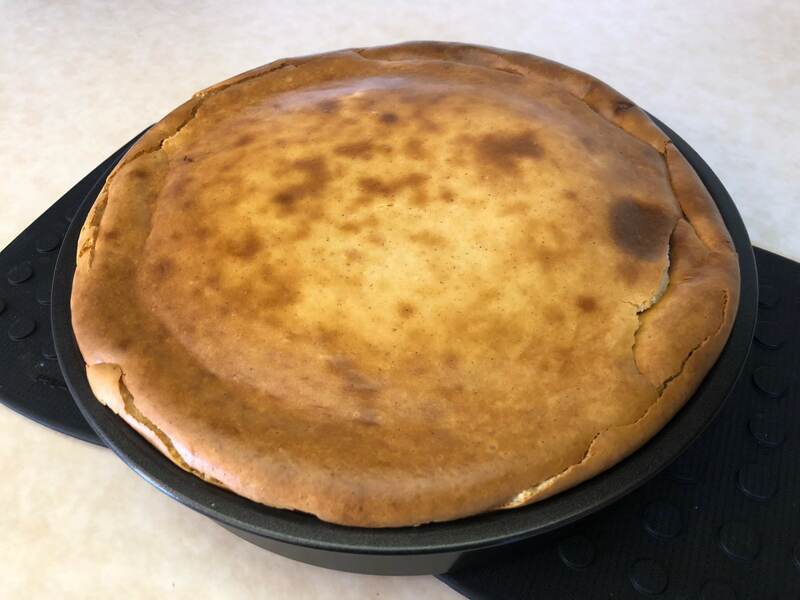 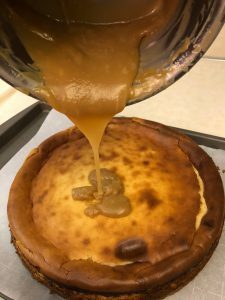 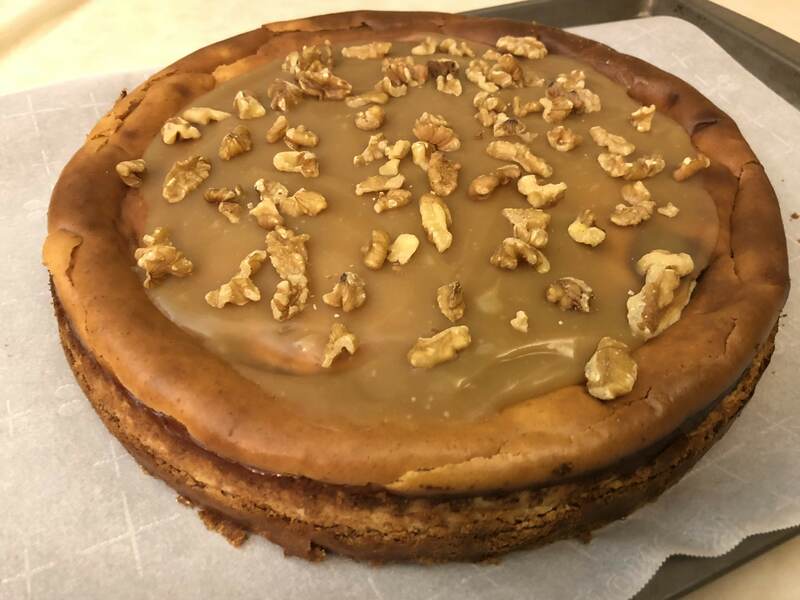 No meal is complete without dessert, so I made a Spiced Maple Cheesecake. 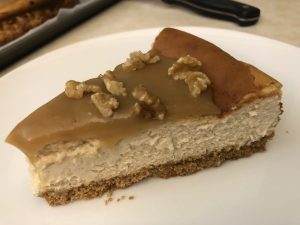 This decadent fall cheesecake is the perfect dessert – not too sweet, not too spicy, smooth, and a little nutty! 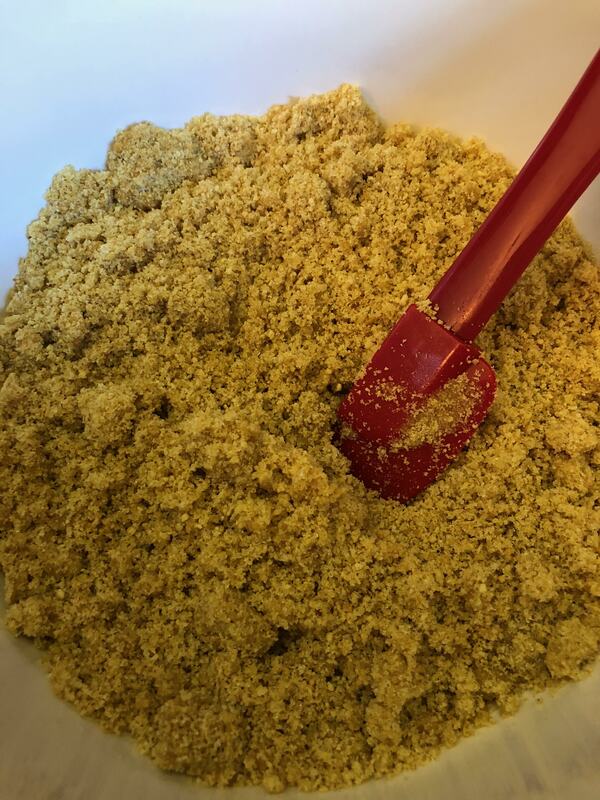 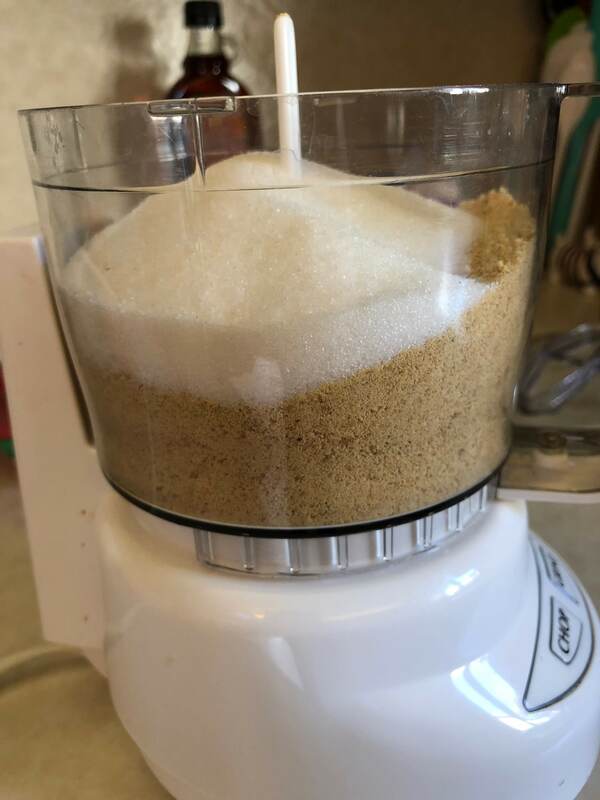 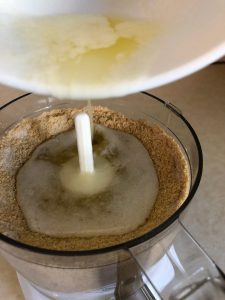 Combine graham cracker crumbs, butter, and sugar, and transfer to a springform pan. 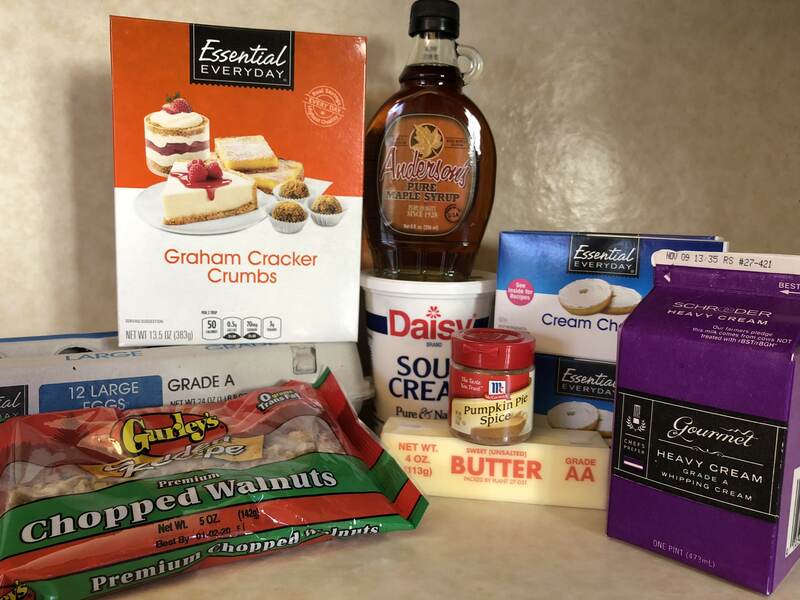 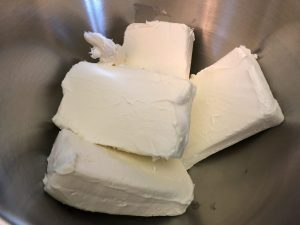 I used a food processor to combine the ingredients, but you can mix in a bowl and get the same results. Press into the bottom of the pan to create a crust. 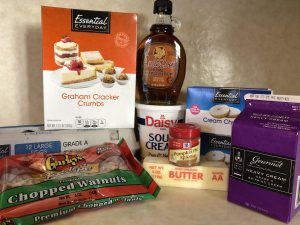 Bake at 350 for 6-8 minutes. 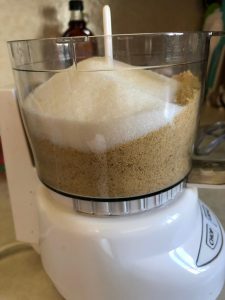 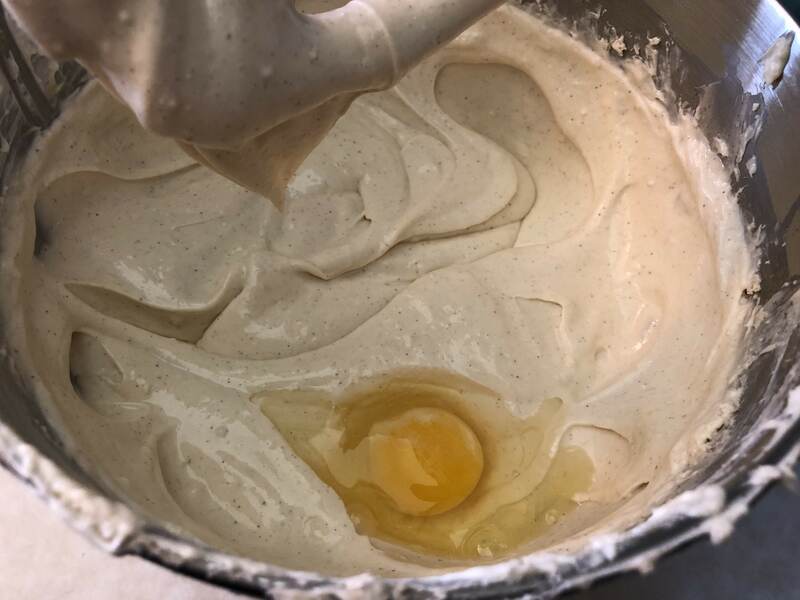 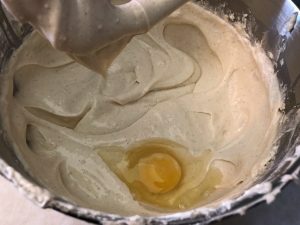 You’ll want to use a stand mixer or hand mixer for the next step or your arms will be quite sore! 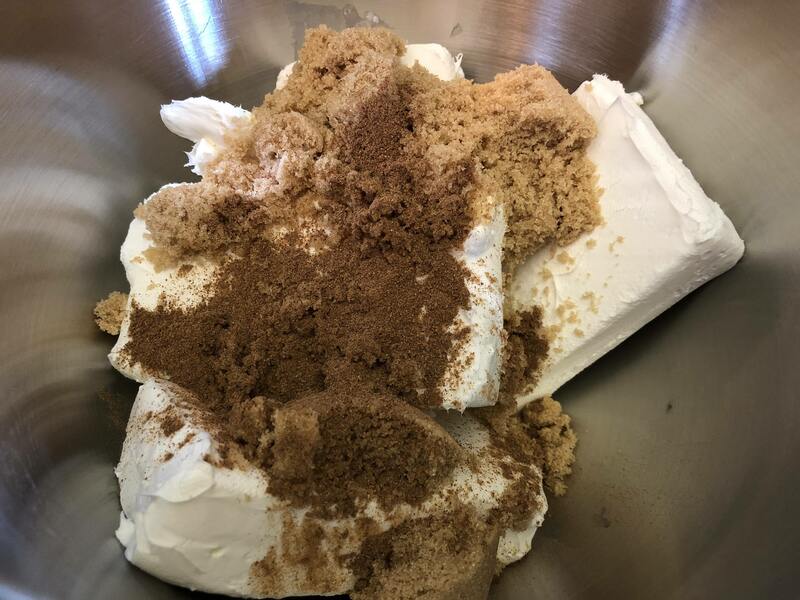 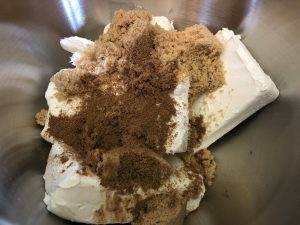 Beat the cream cheese, brown sugar, and pumpkin pie spice until blended. 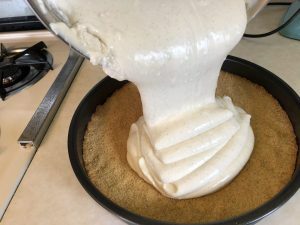 Add the sour cream and maple syrup and mix well. 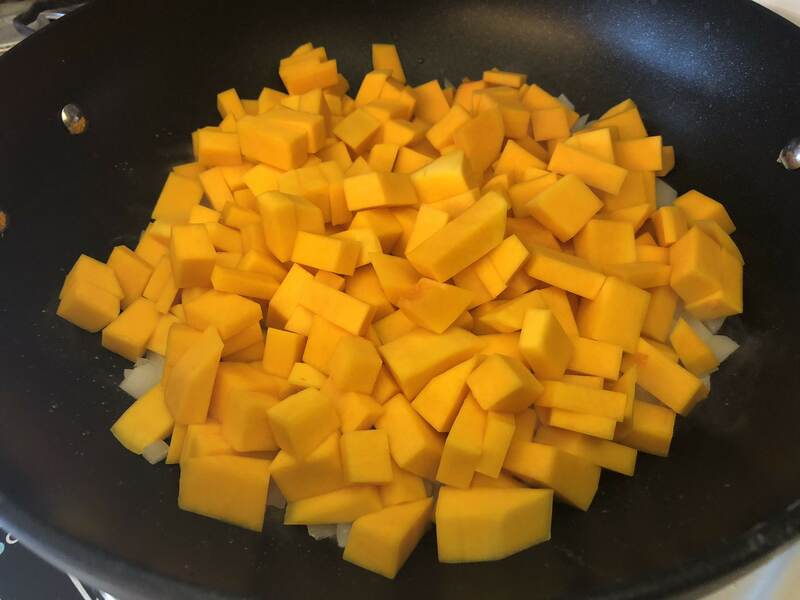 Then add the eggs and continue to beat until incorporated. Pour this over the pre-baked crust. Reduce the oven temp to 325 and bake for 50-60 minutes, or until the center is almost set. 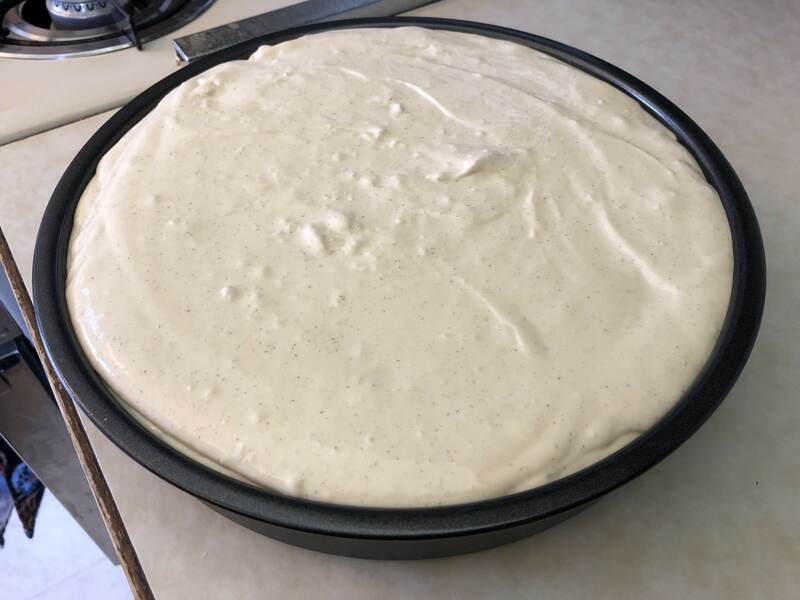 Cool on the counter for about 1 hour, then cool completely in the fridge for at least 2 hours. 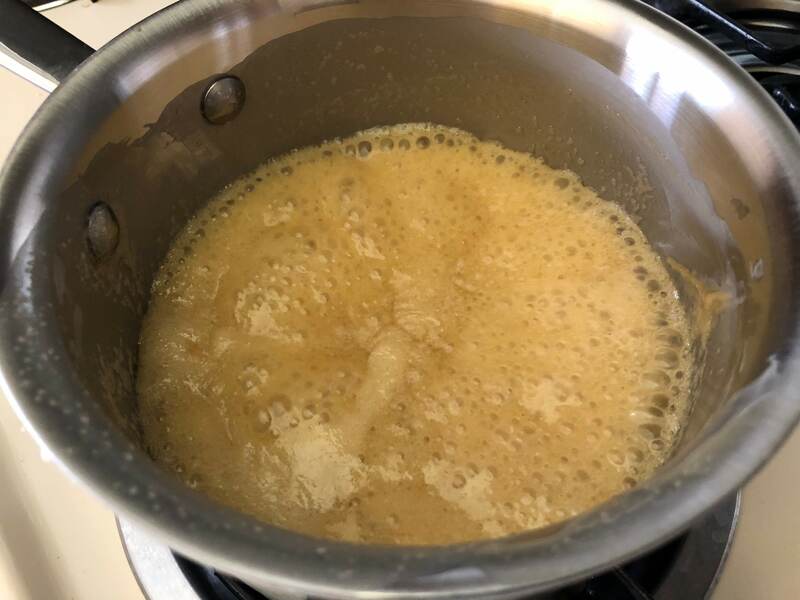 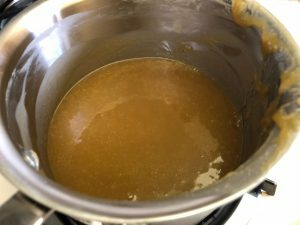 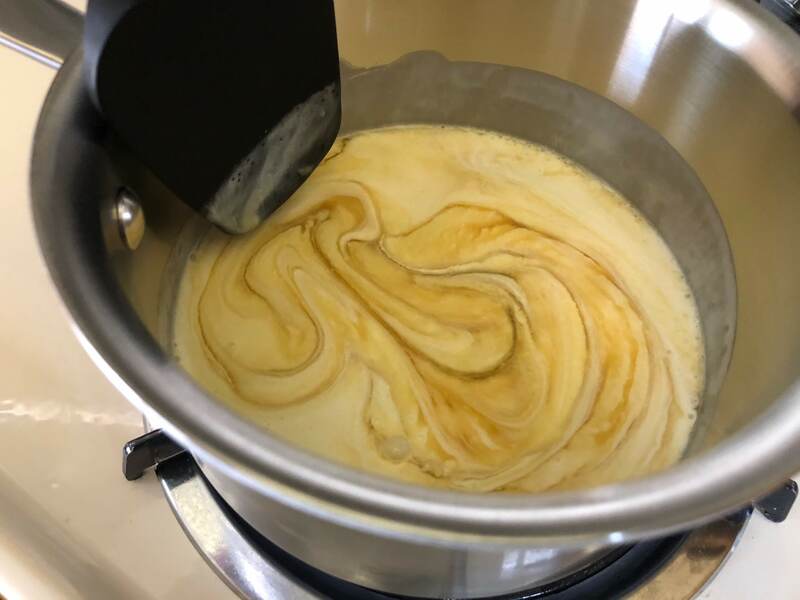 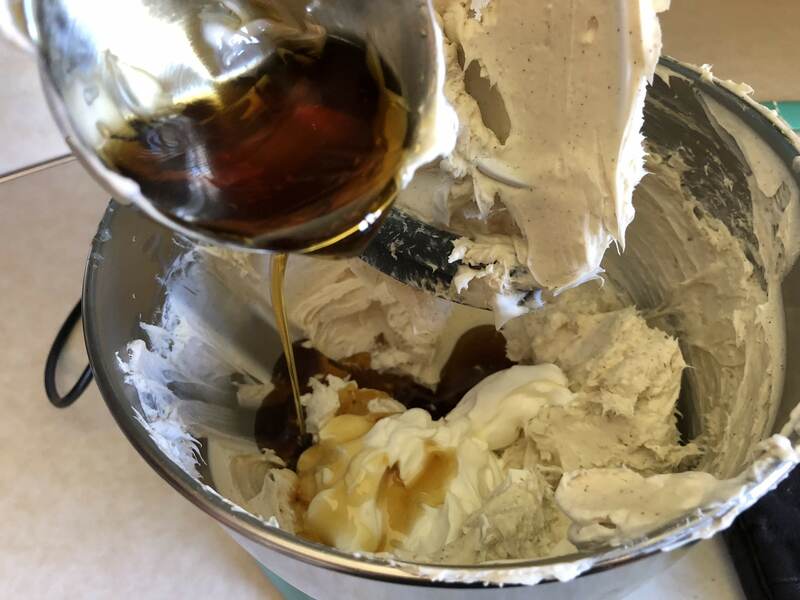 Use a medium sized saucepan to bring the whipping cream and maple syrup to a boil. Then reduce the heat and simmer for about 10 minutes. Pour the mixture over the cooled cheesecake and spread to the edges. 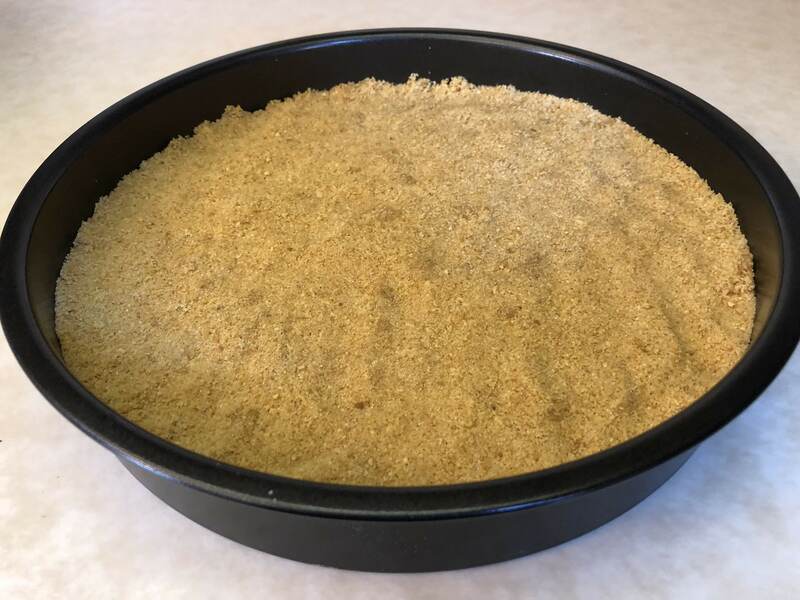 Remove the outside edge of the springform pan, sprinkle chopped walnuts on the top, slice, serve, and enjoy! 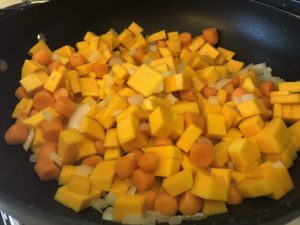 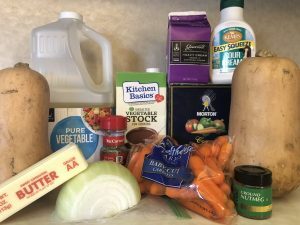 This entry was posted in Uncategorized and tagged Bisque, Butternut Squash, Butternut Squash Bisque, Cheesecake, dessert, Soup, squash. Bookmark the permalink.